When was the last time you made an assumption that turned out to be incorrect? Making assumptions when you’re buying or renting property can result in heartache. Sometimes, it could have financial consequences too! It could be losing a house you thought you were sure to buy, or finding out that your belongings as a tenant are not covered by your landlord’s insurance. 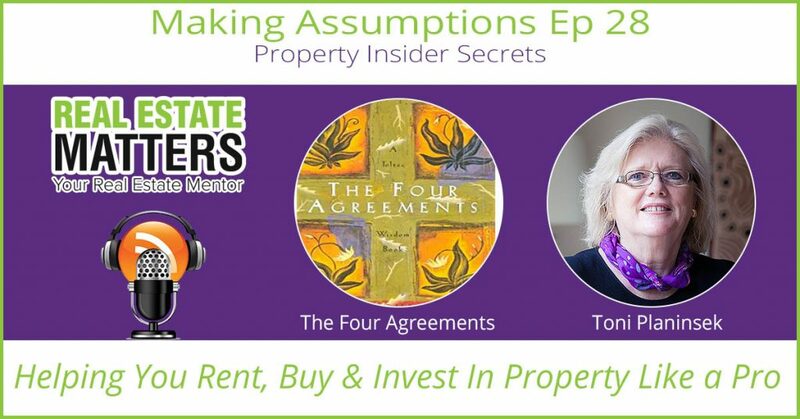 In this episode of Real Estate Matters, Toni looks at two examples from her own business where making assumptions had bad results. She also talks to us about how to avoid making assumptions in the first place. Do you assume that when you place an offer to buy a house, that it means that house is yours? It’s not uncommon, especially for young buyers, to have their offers rejected by the vendor, and it’s not always clear why. Toni explains why it’s more complicated than just “making the offer”, and what considerations (besides money!) you should look at, when you’re talking to your real estate agent. It’s not always clear in a rental situation what’s covered by whom when there is damage to the property. In her second example, Toni looks at a case where a tenant’s computer was damaged by a water leak. Whose insurance covers the damage? Toni explains what happened in that case, and other steps you should take as a tenant, to avoid assuming you’re covered, and ensure that you’re protected. Finally, Toni explains the importance of keeping yourself informed and always asking questions! What does it mean to make assumptions in real estate? Why do vendors reject offers? Who is liable for damage to a tenant’s belongings?